Britsh firm Reckitt & Colman (now Reckitt Benckiser) first marketed buprenorphine under the trade names Temgesic (sublingual/parenteral preparations, no active additives) and Buprenex (parenteral, no active additives). Two more recent formulations from Reckitt Benckiser have been approved for opioid addiction treatment in the U.S.: Subutex (lemon-lime flavored sublingual, no active additives; in 2mg and 8mg dosages) and Suboxone (orange-tang flavored sublingual, one part naloxone for every four parts buprenorphine; hexagon shaped tablet in 2mg and 8mg dosages). Suboxone contains the opioid antagonist naloxone to deter illicit intravenous preparation of the tablet, this is intended to attenuate the effects of buprenorphine on opioid-naive users should this formulation be injected - however no human studies have been done demonstrating the efficacy of this approach with buprenorphine. It must also be noted that buprenorphine in and of itself will induce a precipitated withdrawal syndrome if ingested by an acutely opioid dependant/intoxicated individual. Buprenorphine is a thebaine derivative, and its analgesic effect is due to partial agonist activity at Î¼-opioid receptors. Buprenorphine is also a Îº-opioid receptor antagonist. The partial agonist activity means that opioid receptor antagonists (e.g., an antidote such as naloxone) only partially reverse the effects of buprenorphine. Buprenorphine hydrochloride is administered by intramuscular injection, intravenous infusion, via a transdermal patch, or as a sublingual tablet. It is not administered orally, due to very high first-pass metabolism. 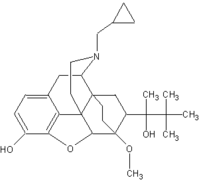 Buprenorphine is metabolised by the liver, via the CYP3A4 isozyme of the cytochrome p450 enzyme system, into norbuprenorphine (by N-dealkylation) and other metabolites. The metabolites are further conjugated with glucuronic acid and eliminated mainly through excretion into the bile. The elimination half-life of buprenorphine is 20.4â€“72.9 hours (mean 34.6).